Subscribe to the Ministry of Restoration's Weekly messages, prayer requests, weekly blog, devotionals and teachings that will change your life! "2019 PEACE BE WITH YOU!" While meditating on a message for 2019 I felt like the Lord would speak through a scripture and He gave me John 20:19. Jesus had risen from the dead and the disciples were all huddled together in fear for their lives when Jesus appeared and said to them, "Shalom." In the world there is no peace, but for us who are born again followers of Christ we are promised to have Shalom! As we enter 2019 in a time of political chaos, division and financial uncertainty we have to remember who we are and to Whom we belong. The Hebrew word for peace is Shalom which means: peace, harmony, wholeness, completeness, prosperity, welfare and tranquility. In order for us to experience Shalom we must be still in the midst of the storms of life, always looking to Jesus who is ever present to calm our fears and concerns that plague us, trying to rob our peace and steal our joy! So, with this in mind I say to you in 2019, "Shalom!" RTC is an equipping ministry for those seeking a higher level of service, dedication and consecration in serving the Lord. Our mission is to train and equip individuals in the Body of Christ to become true disciples of the Lord Jesus Christ through sound biblical teaching, personal experience and hands on ministry. My wife Mary Ann and I have been involved in virtually every aspect of ministry in the past thirty years which includes residential care for life controlling issues, family counseling and ministry in the criminal justice system. We have ministered within the Parole Division in Texas and have been involved in prison and jail ministry throughout Texas, Oklahoma and Louisiana. 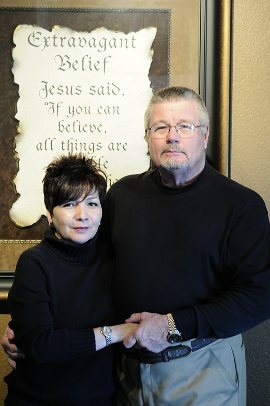 Both Mary Ann and I are ordained non-denominational ministers of the Gospel of Jesus Christ and Certified Belief Therapists through the ministry of Therapon Institute which is recognized by the State of Texas as a viable counseling ministry. As a result of our personal hands on experience we feel led to share with others the power and anointing that comes through a daily walk with God in prayer and study of His word. Our vision is to spread the truth of the Gospel of the Lord Jesus Christ around the world, not only in word but in actually doing the greater works that He promised. If you would like to know more about the Ministry of Restoration or would like to receive our weekly messages please contact us. "The Spirit of the Lord is upon Me, because He has anointed Me to preach the gospel to the poor: he has sent Me to heal the brokenhearted, to proclaim liberty to the captives, and recovery of sight to the blind, to set at liberty those who are oppressed; to proclaim the acceptable year of the Lord." Be sure and check out our weekly messages that will stir your heart and hopefully strengthen your walk with the Lord Jesus. Our desire is to restore the gospel of Christ and promote the kingdom work of service to His saints! For over 38 years I have preached the un-compromised word of the kingdom with passion and a desire to see people be all that they can be in Him who has made us more than conquerors!